By now the news of Charlotte’s birth is on Facebook and pictures of our sweet grand baby have been posted. The text messages that have been flying between here and Chicago are slowing down. 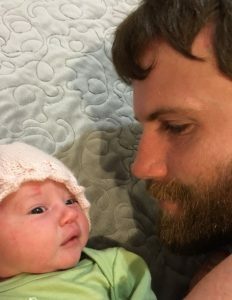 It is time for the birth story. 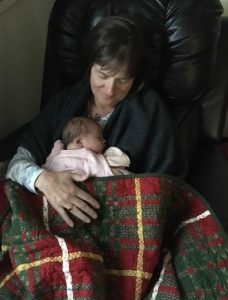 Gramma’s birth story. 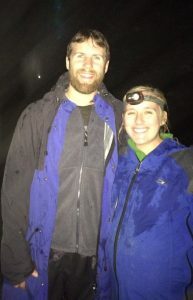 Last Sunday night, James, Anne and I hiked to the glow worm cave with a group of campers. I’ve done this hike two times before and knew it was a short though strenuous hike. It required climbing up and down a steep trail, sometimes scrambling over fallen trees, wading through a cold stream to the bottom of a ravine where a waterfall met sky and darkness, and the walls of the “cave” were lit up with glow worms. I also knew that James would take good care of Anne during the hike. If Anne hoped to start labor by this means, it was a successful endeavor. She was four days past her due date and oh-so-ready for baby to arrive. Contractions started within a few hours, around 1 a.m. I slept through the first several hours, vaguely aware that there was movement in the house and something might be happening. Anne labored through the morning and talked to her midwife a couple of times. Before noon, they decided to go into town, to a friends’ house, to be closer to the birthing center. On the way, they stopped in at the midwifery clinic to ask a few more questions. There they learned that her water had broken and it was stained with meconium. She was sent to the hospital for monitoring. I followed them, first to Leamington, and then on to Hamilton. At first, I settled in at a nearby cafe to read and wait for news. After an hour or so, I texted James to see what was being said, and told him that I was in the area. They invited me to come up and visit. Annie had asked for an epidural so I hung around for the procedure and then returned to the waiting room. In the meantime, they worked at regulating the epidural and started oxytocin to increase the strength of her contractions. Later that afternoon, I went back in, staying longer than I’d planned as I watched the nurses and doctors evaluating her contractions and the baby’s response. I finally pulled myself away and went to find a nearby hotel room. Just before I left, they mentioned the possibility of a c-section. James asked for a few minutes to pray. They agreed and started filing out of the room, but he told them they were all welcome to stay. They did—doctors and nurses and midwives bowed their heads while James prayed. Peace settled over them and they decided to go ahead. 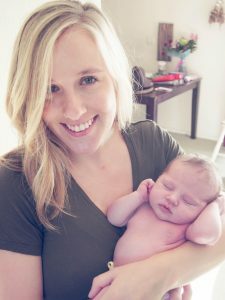 Anne already had the anesthesia needed for the surgery (epidural) so it wasn’t long before Charlotte entered the world with a good, strong baby cry. 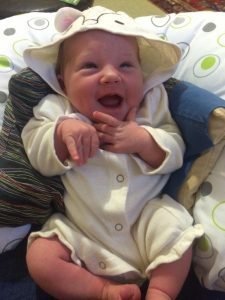 She was suctioned (because of the meconium) but was heathy and strong–perfect! Laura and I had been texting back and forth waiting for news from the hospital. Finally, we both texted James (he was a little busy) for an update and got the word that all was well. I was invited back to the hospital to spend the night with Anne, as James wasn’t allowed to stay overnight on a women’s ward. I met Charlotte Aroha Bruce in the recovery room—the midwife snuck me in—but didn’t hold her til several hours later. I tried to stay on the edges of things until after James finally pulled himself away. He went and used my hotel room for a few hours of badly needed sleep and I camped out at Anne’s bedside. Sometime around 3 or 4 in the morning, I asked if I could hold her and sat snuggling with her for the next two hours while Anne dozed in and out of consciousness. When James returned, I went back to the hotel for some sleep, then stopped by for another visit before going home to shower and rest in the sun. I went back late in the evening to do another shift with Anne. This time she was more awake and eager to hold her baby. It was a sweet night. The next day I went back home and stayed away, resting and doing laundry etc. They moved to a nearby birthing center where they could spend 48 more hours together with support staff on hand. (All this free through socialized medicine!) Others visited throughout the day and their first night was fairly peaceful. I visited the next afternoon, along with more visitors, and headed home to await their arrival the next day. But that night didn’t go so well, so they asked me to come back in the morning and hold Charlotte while they slept. Oh, yeah. They were still feeling sleep deprived and unsure what the night ahead would hold so they asked me to hold Charlotte while they tried to sleep a few times during the day and evening. The ABS staff came by to greet Charlotte and then we had dinner. I got in one more cuddle session with Charlotte while they rested and then left to stay in town, so they can have time alone as a family. Anne is loving being a mum, adapting well to all the challenges. It has been sweet watching her blossom as a mama. Charlotte is a happy and well-loved baby. James is over the moon. And Gramma is blissfully content. This entry was posted in Genealogy, Life Lessons, Travel by Christine. Bookmark the permalink. Very happy for all of you. Sounds like mom and baby are getting excellent care. Congratulations!